With each new semester comes new book lists: Machiavelli, Organic Chemistry, French grammar — you name it, it’s likely to be required for Loyola students. Of course, book lists lead to actually ordering the books. Where do students turn? The Phoenix compared book prices at the Loyola University Bookstore (6435 N. Sheridan Road), Beck’s Book Store (6464 N. Sheridan Road) and online booksellers Amazon and Chegg, and found that Chegg was the best value overall. Comparing five required textbooks from different departments, Beck’s and Chegg are tied for the lowest on two titles. Buying Puntos de Partida: an Invitation to Spanish from Amazon saves students $186.75 from LUC Bookstore prices. Renting Genetics: A Conceptual Approach from Beck’s saves students $56.58 off Amazon prices. On the other three titles researched, the prices from the four sellers were relatively comparable. In recent years, however, students seem more and more displeased with LUC and Beck’s bookstores’ services. According to Julie Strand, a 20-year-old ad/PR major, buying online has become a much more desirable and convenient option. Online mega-store Amazon is well known for its low prices, and students often find textbooks for a fraction of retail prices. Amazon also has connections with thousands of third-party sellers, who often sell deeply discounted used books. Chegg, a less-known online seller started in 2005, offers book purchasing and rentals, as well as homework and schedule help. According to Aubrey Leese, 18, a freshman psychology major, renting with Chegg is easy. In regards to the online-ordering movement, Follett, the company that runs LUC Bookstore, is not falling behind. In fact, Follett is a frontrunner in the online industry and has been selling its products online since 1999. According to Elio DiStaola, director of public relations for Follett, the giant corporation is aware of the huge amount of competition on the web, as well as the fact that students tend to shop for their books from multiple sources. “What we see from a bookstore perspective is while [students] do do that shopping [from multiple sources], the bookstore still ends up being probably the primary choice, just because of that value that the bookstore presents,” DiStaola said. DiStaola cited the confidence the bookstore provides in refunding books in add/drop scenarios as a big positive for bookstores. Follett’s “Rent-A-Text” provides students with the opportunity to save about 50 percent of the original price of textbooks, often paying even less than Follett pays the publisher. But many students perceive the university bookstore to be costly. DiStaola wished to emphasize that “the pricing of books all starts with the publisher,” which makes retail prices somewhat out of the bookstore’s control. Additionally, in cases of low returns with buy-back, DiStaola stresses that the entire process is driven by supply and demand, depending on orders from faculty members at Loyola and across the nation. As technology advances, the textbook industry and its beneficiaries must adapt to changes. Loyola’s own Executive MBA program through the Quinlan School of Business provides iPads to each member of the program. Assistant Dean for Executive Degree Programs Pamela McCoy said that this initiative has been well received since it began in January 2012, but that they are still working all the kinks out. There are certain limitations when it comes to e-books and other digital materials. McCoy said that there are some challenges associated with format and connectivity issues, but she recognized the convenience of having all materials and resources in one place so that students can access articles or case studies at any time — even on the train. Although the Business School has taken this big step in the digital direction, the Modern Language Department has made use of digital services, including online workbooks and audio exercises for nearly a decade. According to David Pankratz, director of the Language Learning Resource Center, many instructors of language courses use online components in which students listen to audio recordings and respond, or complete other exercises. 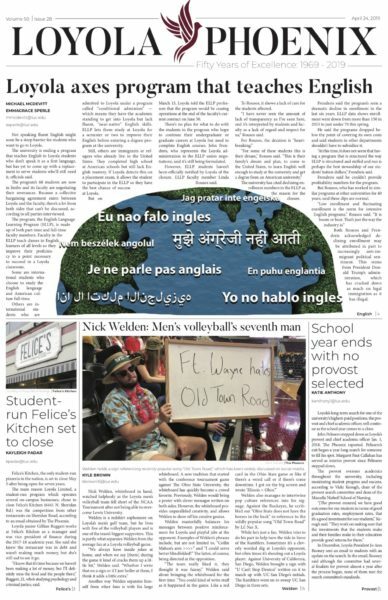 Pankratz said that there has not been “any desire really or any push to go towards e-books as primary textbooks in language courses,” because language courses are so interactive. You can help a great cause with on-line book purchases by using BookBenefit.org.